PNL continues to be especially active managing $10MM's of our clients' site remediation liabilities, especially in the West and along the Gulf Coast. Our work focus is especially on complex CERCLA and RCRA sites, where multiple PRP stakeholders help drive the work under the regulatory oversight of either U.S. EPA or the respective State Agency(-cies). In addition, in partnership with sister solar power developer, PVNavigator, LLC, which focuses on solar projects on closed landfills and brownfield sites, PNL is also providing solar power consulting services to a home developer and a university. View PDF to read more. 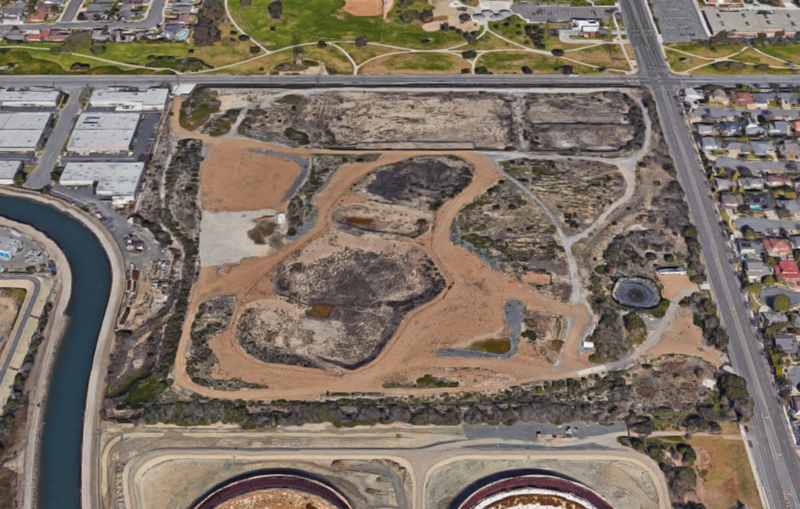 Project Navigator's Ascon Landfill Site team has secured the proper approvals to move ahead on the final remedy for this 38-acre former oil waste landfill. These approvals included DTSC approval of the Remedial Action Plan, DTSC certification of the Environmental Impact Report, and City of Huntington Beach Planning Commission approvals of the required Coastal Development Permit and Conditional Use Permit. Project Navigator, Ltd. will be participating in a community meeting during December to educate neighbors and other stakeholders about the remedy and the safeguards that will be taken to minimize any impacts to the community. Construction is scheduled to begin in early January, 2019. 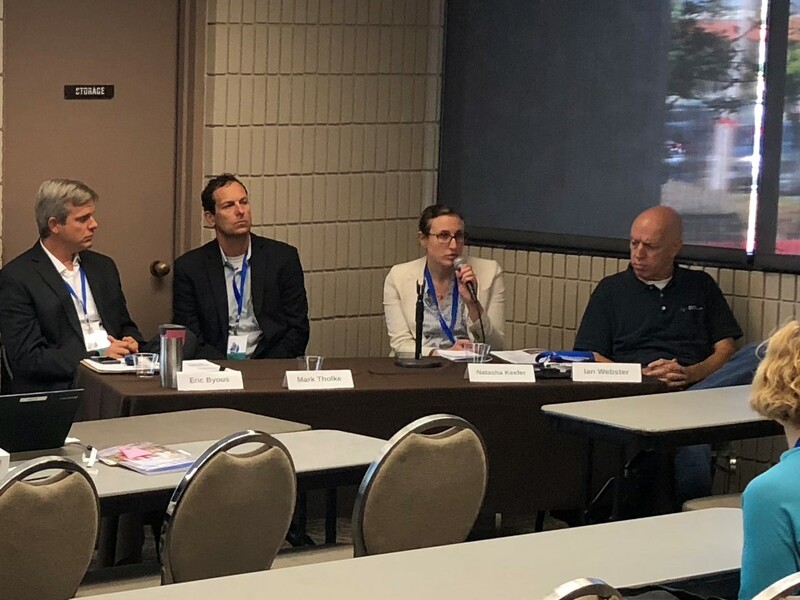 PNL's Dr. Ian Webster presented and participated in a panel discussion about the development of solar power installations on Brownfield sites at this major event hosted by CCLR, U.S. EPA and DTSC. Panel participants included representatives from U.S. EPA Region 9, and Southern California's new local community choice power provider in the Clean Power Alliance (www.cleanpoweralliance.org). The panel's discussion deck is here, with the full agenda here. Ian described a site-reuse vision, where in contrast to large acreage, remotely located, multi-megawatt solar projects; smaller, single-MW capacity solar developments on urban brownfield sites and landfills would feed a distributed urban microgrid. Ian can be contacted at iwebster@projectnavigator.com or 714-863-0483. PNL has worked for PRPs managing environmental response actions at Gulf Coast CERCLA sites since the company's founding 21 years ago. Major, complex CERCLA remediation programs under PNL's direction, such as Malone, Tex Tin and PAB Oil & Chemical have run from their early RI/FS stages, to RODs, to RD/RAs and now into their respective long-term OM&M phases. However, with recognition that PRPs (1) still require an entity cost-effectively to "steward compliance" where major investments have been made, while (2) simultaneously seeking opportunities to develop a "consent decree-walk away-end game" solution, PNL has been interacting with PRPs and U.S. EPA Region 6 in the planning of a Long-term Site Management Entity. This month PNL hosted webinars on the topic with over 30 major companies participating. During 2019, PNL will continue to refine this new mature CERCLA site management system, further involving PRPs and EPA, while especially recognizing how many of the recommendations from EPA's Superfund Task Force can be put into action via the proposed entity. Many of the "entity's key factors" such as site title transfer, liability management, legal and regulatory compliance, and OM&M reporting, which could be managed via PNL's Land Navigator, LLC. For more information on this topic please contact Marc Ferries in Houston at mferries@projectnavigator.com or 713-468-5995. 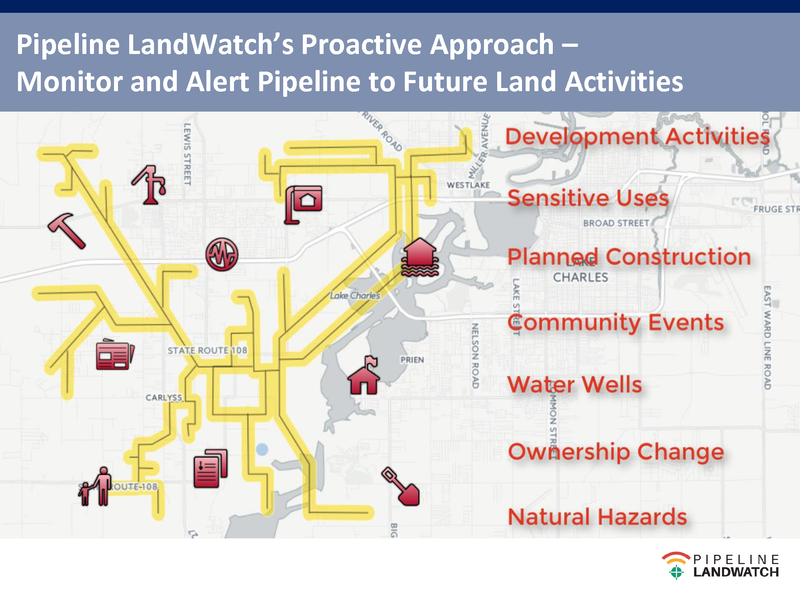 Project Navigator, Ltd., has worked in partnership with Terradex, Inc. (Palo Alto, CA) to conceive of, and develop a web-enabled, pipeline integrity monitoring system called Pipeline LandWatch, LLC. The service is in the process of being rolled out to pipeline owners and operators. An explanatory article has been published, and is online in the trade journal, North American Oil & Gas Pipelines, July 25th, 2018, edition. 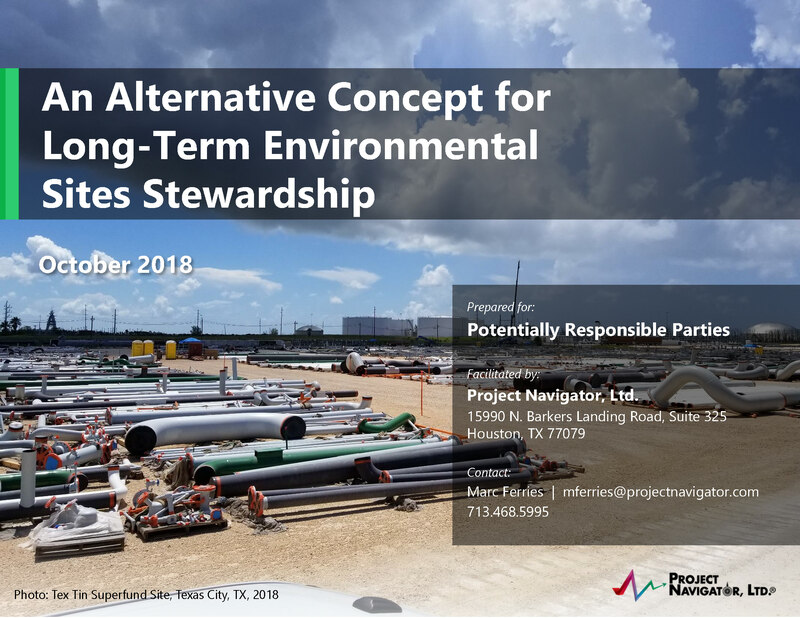 In this article, Genesis Energy, L.P.'s Kristi Unzicker and Project Navigator, Ltd.'s Bob Piniewski describe how, via collaborative effort of many stakeholders, and U.S. EPA certifying the site as "ready for reuse", the former Tex Tin CERCLA site is presently functioning as a crude oil terminal. Bob Piniewski can be reached at bobp@projectnavigator.com or 919-539-1928. 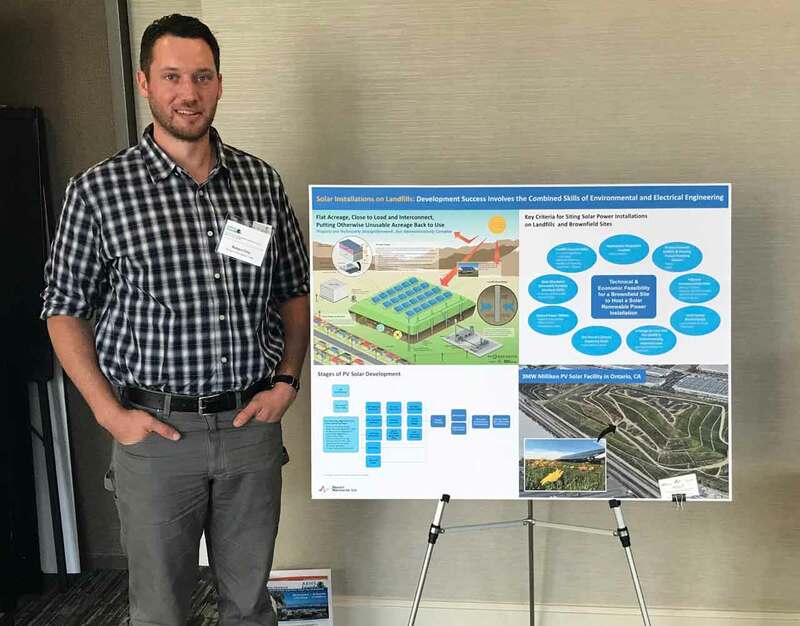 Project Navigator, Ltd.'s Robert Fritz presented a poster on solar facilities on landfills, brownfields and Superfund sites at the March 2018 AEHS Winter Meeting in San Diego, CA. PNL works with our sister company TerraNavigator, LLC on the conception, planning and development of utility scale solar power projects on landfill sites. For example, see here, for a 3 MW, 15-acre, solar power project which PNL and TN planned, designed, permitted and constructed on the County of San Bernardino's Milliken Landfill in Ontario, CA. Our poster at the AEHS meeting highlighted the combination of skill sets (environmental, civil, and electrical engineering) which are required, and exist within PNL, to bring such projects to fruition. PNL provided Project Coordination, Remedial Action Construction Management and Health and Safety oversight through the entire RA at the Malone Service Company Superfund Site. A large portion of the 3+ year Remedial Action was completed throughout 2017, including construction of a 30 acre RCRA "C" equivalent Cell, solidification of over 300K cubic yards of hydrocarbon sludge and placement within the Cell followed by construction of a RCRA "C" equivalent cap. Over 60,tons of riprap was delivered and placed along the banks of Swan Lake in Lower Galveston by as shoreline protection for the Cell. During the entire Remedial Action over 40 million gallons of contact storm water was managed and disposed of through the two on-site permitted injection wells. PNL held the Final Remedial Action Site Inspection with EPA and TCEQ in December 2017. PNL continues to manage O&M activities at the Site such as Cell maintenance/monitoring, leachate management/disposal, groundwater monitoring and stormwater monitoring. Project Navigator, Ltd.'s Houston office staff have been managing interim action activities at the Brine Superfund Site in Corpus Christi, Texas. The work has involved installing a cap by the site's East Ditch. The interim cap was then covered with a concrete erosion protection mat. For more information, please contact Marc Ferries at mferries@projectnavigator.com. Project Navigator, Ltd. (PNL) performs as the Independent Review Panel (IRP) Manager at PG&E's Cr(VI) groundwater remediation project in Hinkley, CA. The IRP Manager's role is one of technical outreach, communication and facilitation within the myriad of project stakeholders; who range from PG&E, to the Water Board, to individual community members, seeking technical information. Newsletters prepared by PNL are issued to the Hinkley Community bimonthly, and contain project technical information, frequently asked questions, notices of upcoming meetings, office hours, and Community announcements. Click here to see the latest version of the newsletter. PNL staff brief the Hinkley Community at quarterly meetings at the Hinkley Senior and Community Center. PNL also holds office hours three times each month, providing residents the opportunity to ask questions regarding the large and groundwater remediation efforts, and a PG&E-funded, but independently managed, separate USGS groundwater investigation. 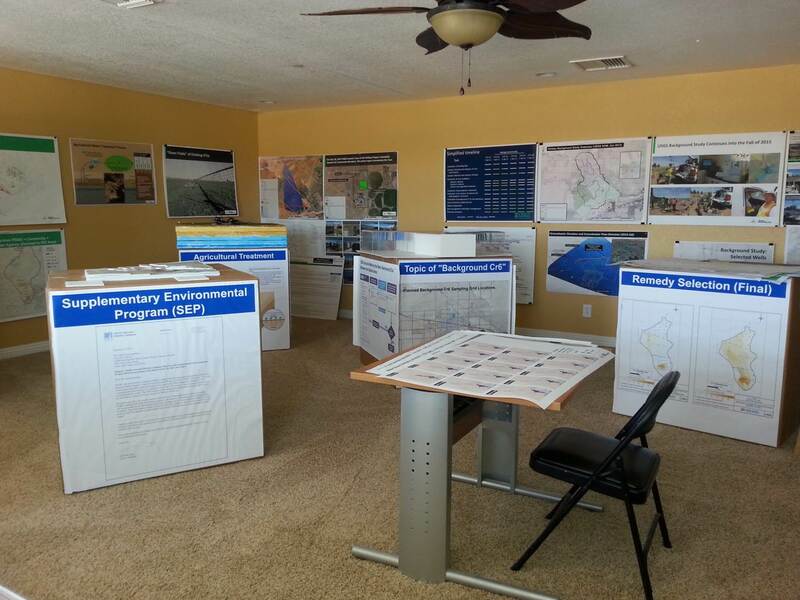 PNL in Hinkley has a dedicated library with all the necessary visual information to explain each aspect of PG&E's Remediation Program and the USGS Cr(VI) Background Study. Click here for an image of the IRP Manager's back room library. The USGS Study will determine the natural level(s) of Cr(VI) in groundwater throughout the Hinkley Valley. Regular Technical Exchange meetings are led by PNL staff. DALLAS - The U.S. Environmental Protection Agency (EPA) recognized stakeholders at the former Tex Tin Superfund site in Texas City, Texas, with EPA's Excellence in Site Reuse award. The award recognizes Superfund site partners who have collaborated with EPA to support redeveloping Superfund sites in ways that are beneficial to the community and compatible with the cleanup. The former tin and copper smelter was placed on the National Priorities List of contaminated sites in 1998, and following extensive cleanup and monitoring is now being reused as a bulk oil storage and transfer facility. EPA honored the partners who worked toward redeveloping the site for beneficial and protective reuse. Honorees included current Texas City Mayor Matthew T. Doyle and past mayors Charles T. Doyle and Carlos Garza; Port of Texas City; Texas City Terminal Railway Company; the Tex Tin Superfund Site Steering Committee; Robert Piniewski, coordinator for contractor Project Navigator, Ltd.; Danny P. Brown, manager for remedial contractor RECON Services, L.P.; and Genesis Energy, L.P., the site developer. "The Tex Tin site shows the benefits of stakeholders working together to make the most of formerly contaminated sites," said Acting Regional Administrator Samuel Coleman. "Because of the efforts of these different groups, the site is now an active part of the Texas City economy." "At EPA's behest, future development was included as a key consideration for the remedy at the Tex Tin Site. 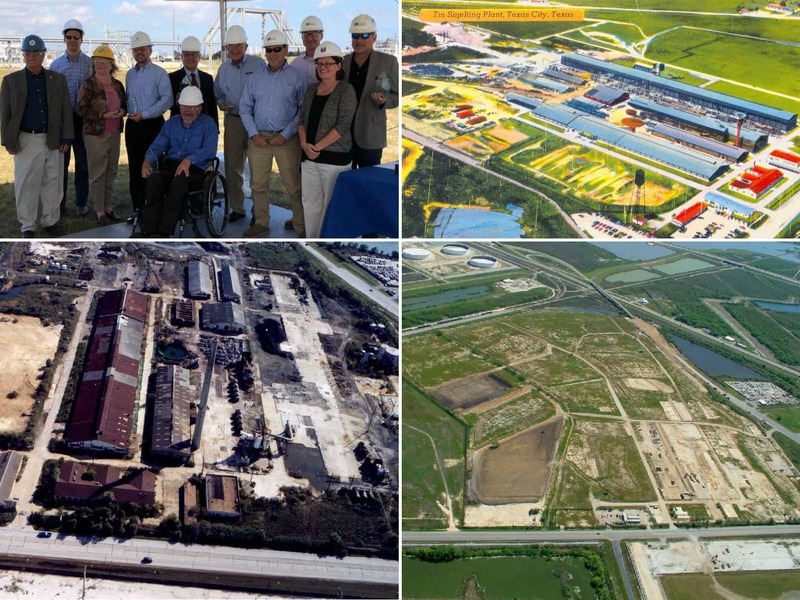 Future development served as a guiding principle throughout the design and successful implementation of the Tex Tin Site remediation, which culminated with construction of Genesis's terminal; a great example of EPA's goal of helping the community reclaim a former Superfund site," said site steering committee co-chair Edgard Bertraut. "EPA, and later Genesis, worked cooperatively and diligently with the Tex Tin Steering Committee throughout the process of expedited remedy design, remedy implementation, and site redevelopment." The former Tex Tin site, on about 140 acres near Galveston Bay, operated as a tin and copper smelter from the beginning of World War II until the mid-1980s. Cleanup at the site addressed waste piles, wastewater treatment ponds, acid ponds and smelting-waste slag piles, and contamination in nearby Swan Lake Marsh and the surrounding ecosystem. EPA has supported beneficial reuse at the site for many years. 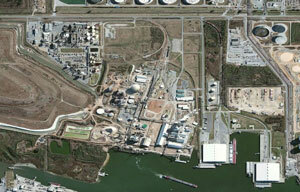 In 2001, EPA awarded a Superfund redevelopment grant to Texas City. In 2003, EPA issued the nation's first Ready for Reuse determination for a Superfund site, which stated the site remedy would remain protective for industrial uses (as long as certain conditions were met). This determination gave potential developers assurance from EPA that the formerly contaminated site is clear for appropriate industrial reuse and redevelopment. Redevelopment began in 2015, with coordination from EPA, other cleanup partners, and Genesis Energy, LP. to ensure the site remedy was protected during construction and future use. The formerly contaminated, abandoned site now employs several workers, supports local industry, and contributes to the Texas City economy. 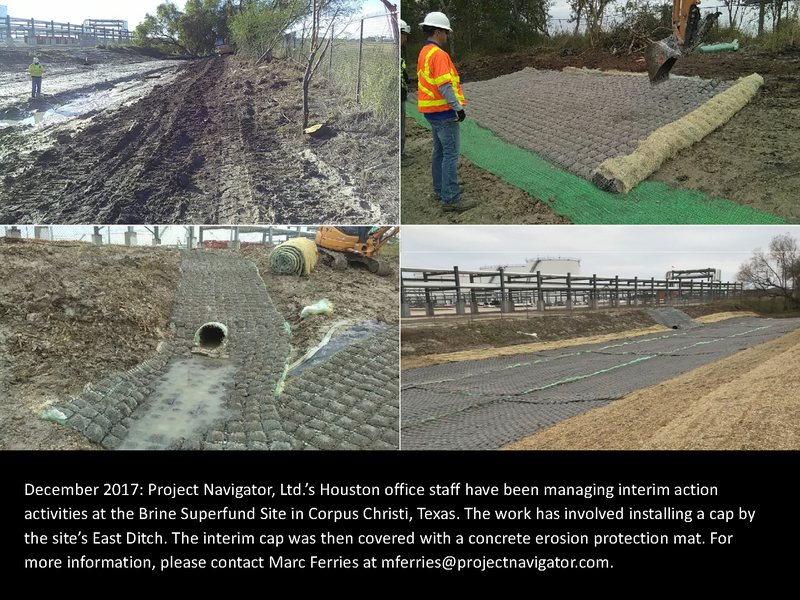 HOUSTON - Project Navigator, Ltd. manages remediation and response actions at several Superfund (CERCLA) sites in the Houston area. Since Harvey departed the Houston area during the week of September 3rd, PNL staff have accessed these sites, assessing conditions, and verifying continued remedy functionality. PNL has a series of well-planned storm response actions (see accompanying Figure), all of which were, and are, in action at our Houston CERCLA sites. Project Navigator, Ltd. working in association with sister solar power development firm, PVNavigator, LLC, and Marina Energy, LLC of South Jersey Industries (Folsom, NJ) has developed and commissioned the operation of a 3 MW PV solar power installation on a former Owens Corning landfill site in Gloucester Township, New Jersey. Combining PNL's knowledge and expertise on the reuse and repurposing of closed landfills, with sister PVN's expertise in solar power installation interconnection, permitting, and design allowed an early project concept to become reality over a period of four years. See more here. PNL staff members Dr. Raudel Sanchez and Dr. Halil Kavak continue their support of Hinkley Community outreach and technical communications concerning PG&E's Chromium-6 (Cr-VI) groundwater remediation program in Hinkley, CA. PNL's activities include Community presentations, topic-specific technical guidance to Community members, and the distribution of a newsletter More is at www.HinkleyGroundwater.com. PNL is also part of the project's Technical Working Group, wherein USGS is studying groundwater and geophysical conditions in the Hinkley Valley in order to establish background concentrations of Cr-VI. Such information will subsequently be used by the Water Board to set final remediation targets. Project Navigator, Ltd., and sister company PVNavigator, celebrate the Commercial Operation Date of their utility scale solar development atop the County of San Bernardino's closed Milliken Sanitary Landfill in Ontario, CA. The 3.1 MW PV solar project is now generating the equivalent of 500 homes of renewable energy, selling power under a 20-year Power Purchase Agreement (PPA) to Southern California Edison (SCE). More is here. Project Navigator, Ltd. participated in the sponsorship of a SoCal PEMA luncheon, featuring a speech by CA Senator Kevin de Leon, entitled, "California Environmental Policy: A look ahead as federal policies of the Trump Administration take shape." 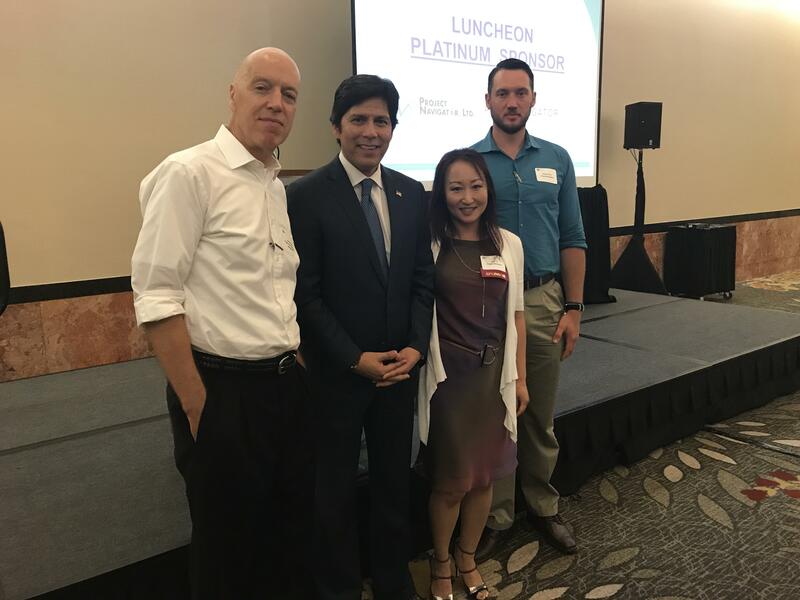 Shown are Project Navigator, Ltd.'s Dr. Ian A. Webster, June Yi and Robert Fritz with Senator Kevin de Leon post the PEMA luncheon on Friday June 9, 2017 in Los Angeles. PNL presents at CCLR workshop in Vista, CA on "Resources for Sustainable Redevelopment and Land Recycling: The Solar Power Tool"
PNL's Dr. Ian A. Webster and Robert Fritz delivered a presentation at a Center for Creative Land Recycling ( https://www.cclr.org/) workshop in Vista, CA on "Resources for Sustainable Redevelopment and Land Recycling: The "Solar Power Tool" (see slides here). Project Navigator, Ltd.'s Dr. Ian A. Webster facilitated a workshop on "Renewable Energy Development on Brownfields: New Opportunities and Issues" at the Farella Braun + Martel, LLP legal firm as part of their Unplugged Renewable Energy Series (see slides here). Other presenters were Jon Benjamin of Farella, Braun + Martel, Karen Irwin of U.S. EPA Region 9 and Mark Tholke of Golden State Renewable Energy. PNL provides Project Coordination and Construction Management services on behalf of the Malone Cooperating Parties for the Malone Service Company Superfund Site in Texas City, Texas. ENTACT is the EPA-approved General Contractor/Engineer, and Geosyntec has provided engineering services for the design of the RCRA Subtitle C Equivalent Landfill. The Remedial Action includes design/construction of a 30-acre RCRA Landfill to contain approximately 200K cubic yards of impacted soils and 285K cubic yards of solidified hydrocarbon based sludge. The Remedial Action is currently ongoing and approximately 80% complete with final completion expected in June of 2017. Once the Remedial Action is completed, PNL will continue to provide Project Coordination services and will oversee O&M activities, such as groundwater monitoring, leachate management/disposal, and maintenance of the 30-acre closed landfill. PVNavigator, LLC is in the process of selecting an EPC contractor to complete design and build out PVN's 3MW photovoltaic solar power installation on the top deck of the Milliken Landfill in Ontario, CA. The recent job-walk is described here. PVN intends to have the facility operational by Q3, 2016, and will subsequently operate the power plant with power sales under a 20-year PPA to Southern California Edison (SCE). More details on PVN, and this project are at www.PVNavigator.com. Project Navigator, Ltd. in its role as a remediation site project management firm helps source, solar-possible sites, to PVN. After essentially successfully completing Trustee duties at the $50MM demolition, remediation and repurposing for resuse at the former Asarco Smelter in El Paso, TX, (see more at www.RecastingTheSmelter.com), Roberto Puga with key Project Navigator staff have commenced Trustee duties at the Mississippi Phosphates Corporation (MPC) Site in Pascagoula, MS. Transitioning into the role during the past few months, key tasks have included: task and budgetary ranking and prioritization; working with EPA and MDEQ to "stabilize" site conditions to mitigate the possible threat of ponded water releases to the local environment; and developing a longer-term, phased plan to sell assets and remediate the 500+-acre site. PNL is pleased to announce a key addition to our construction management capacity with the addition of Mr. Matt Jackson to the team. Matt is joining PNL in Houston, TX and brings over 28 years of experience in environmental and civil construction. Most recently, Matt served as a Program Manager for RECON, where he managed a group of Project Managers and was responsible for providing support in oversight, cost estimate development, proposal preparation, cost tracking, and scheduling of various large-scale, multi-faceted projects. His particular focus was on solidification/stabilization, demolition, impermeable clay cap construction and other large "dirt work" projects. This included a $185MM portfolio of projects for a major oil company where refineries in the US, Puerto Rico and Canada were decommissioned, demolished and remediated so the properties could be sold. He also lead the efforts to develop RECON's international business in Asia, Mexico, Puerto Rico, and Central America markets. Matt's charge, supported by client demands for an ever present focus on remedy quality, project execution safety and cost-effectiveness, is to add value to our Clients' projects through our construction management group, and to grow PNL's EPC practice. PNL's practice has already managed remedy implementation at CERCLA Sites nationwide, with project values up to $50 million, and included remedy elements from landfill construction to stack demolition to sediment capping. Matt will report to Marc Ferries, PE, Houston Office Manager, and can be reached at (832) 960-4987. Project Navigator, Ltd.'s sister renewable power development company, PV Navigator, LLC, has released an RFP seeking EPC services to assist PVN bring the company's 3MW Milliken Landfill solar power project online by June, 2016. Project Navigator, Ltd.'s sister renewable power development company, PV Navigator, LLC, has released an RFP seeking EPC services to assist PVN bring the company's 3MW Milliken Landfill solar power project online by June, 2016. The solicitation is being managed from PVN's Brea, California office. The RFP is here, with further details here. In late November 2015, Project Navigator, Ltd. (PNL) Houston staff moved to their new and expanded office space where the 10 Fwy and Hwy 6 (Addicks Satsuma Road) meet. This move coincides with recent hires, Marc Ferries and Matt Jackson, to our Houston office. Their extensive experience in environmental management, engineering and construction are invaluable, and enhance PNL's service offerings in our mission to be a first-class environmental project management and strategic consulting firm. For about 4 years, PNL staff have been technically assisting within PG&E's Hinkley, California Chromium-6 remediation program by distilling complex technical information into a form more suitable for Community understanding and decision-making. Significant progress was acheived on November 4, 2015 when the California Regional Water Quality Control Board, Lahontan Region, unanimously approved and adopted a comprehensive Cleanup and Abatement Order (CAO) for plume remediation after hearing separate presentations from Water Board Staff, PG&E and Project Navigator, Ltd (in our role of Independant Review Program Manager). PNL's presentation is available here. Los Angeles, CA - PNL's Dr. Halil Kavak participated in the 11th Annual Student Research Symposium of the Mork Family Department of Chemical Engineering & Materials Science at the University of Southern California. Halil helped judge student presentation and posters, and finally presented the annual Project Navigator, Ltd. Prize to the best presentation in the area of environmental engineering and science. 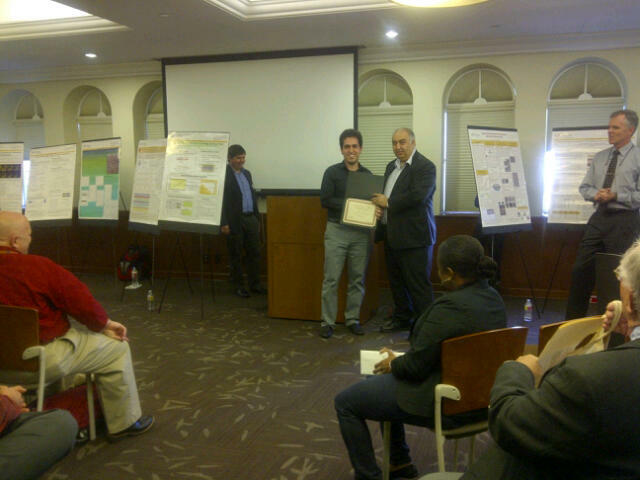 This year's award winner was Hassan Dashtian for Pore Network Simulation of Salt Precipitation in Porous Media. The annual award by PNL continues the tradition of a long relationship PNL has fostered with USC by both financially supporting and counseling research, and hiring USC graduates into the PNL workforce. With the California Regional Water Quality Control enforcement moving towards the adoption of a comprehensive cleanup and abatement order, PNL staff has been busy interpreting and communicating the implications of the Order to the Hinkley Community, and how the Order will affect the scope and pace of remedial activities. A recent Water Board briefing by PNL is here, and more is available at PNL's Hinkley project website at www.HinkleyGroundwater.com. Star Lake Canal, Port Neches, Texas: With a ROD in place, the PRPs are preparing to implement a remedy involving selective soils and sediments excavation, clay/armor capping and long-term monitored natural attenuation. PNL has been initially assigned to manage the administrative and coordination components of the project, as the remedial effort ramps up through design and into construction ( fact sheet). Project Navigator, Ltd. hosted a workshop on May 5-6, 2015 for about 70 oil and gas company site remediation project managers at BP's Learning Facility in the Energy Corridor. The 2-day workshop covered a diverse range of site clean up topics, from the strategic to the tactical, including project case studies, techniques to promote project cost-effectiveness, improve external stakeholder trust, and project scope negotiation strategies. External perspectives were provided by guest speakers from, for example, US EPA Region 6, and Berkeley Earth. Click here for the workshop topics. The success of the event has PNL considering hosting similar, regional conferences in the Northeast and West. Please contact PNL's Elizabeth Schell at 917-494-8423 for more information. We have made two strategic hires providing PNL increased capability to now serve the oil and gas, chemical and aerospace business sector spaces in the West and Gulf Coasts. The addition of Marc and June strengthens PNL's already excellent resources in these locations, and deepens our ability to "think strategically" for our clients in the formulation of site assessments and remedial options at complex, costly projects. Click here to view bios. PNL will be hosting a 2-day Environmental Industry Leadership Workshop in Houston, May 5-6, 2015, featuring 11 guest speakers. The workshop will provide Project Managers with practical information on cost saving strategies at both multi-party and single party sites, liability management, past successful case studies and lessons learned, regulatory changes and how these changes could potentially impact the environmental industry, energy in the 21st century, and sustainable remediation practices. Project Navigator, Ltd staff continue to assist the Hinkley Community, Community leaders, California Regional Water Quality Control Board-Lahontan Region, and PG&E in performing technical outreach and communication regarding PG&E's chromium-6 groundwater remediation program at over 3000 acres in the Hinkley Community to the west of Barstow, California. 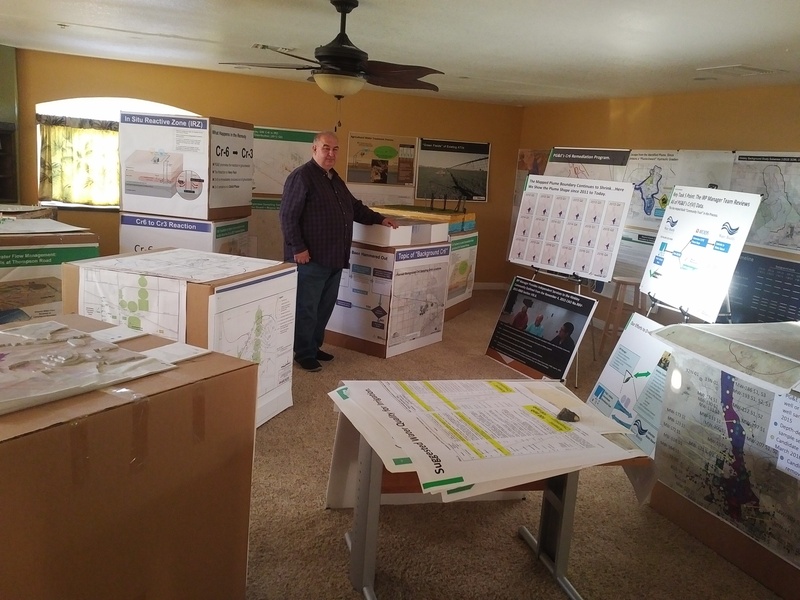 Notable recent events included a PNL presentation describing a long term sustainable remedy-driven vision for the future of Hinkley, and poster presentations by Barstow High School students on the Hinkley groundwater situation. A more comprehensive list of project updates can be found at PNL's project-specific website at www.HinkleyGroundwater.com. PNL staff members Dr. Ian A. Webster and Dr. Nariman Nourbakhsh were invited to participate and speak at The Solar Qatar Summit 2014, in Doha, Qatar, supported by Qatar General Electricity & Water Corporation. Their presentation on behalf of PV Navigator, LLC, focused on the need for strategic facility-location planning to go hand in hand with ambitious plans to develop a PV solar power platform to power Qatar, meet greenhouse gas reduction goals and complement what will eventually be, declining oil and gas reserves. The talk drew upon PVN's experiences and capabilities in the USA in developing MW scale PV installations on closed landfills and brownfield sites. The need to use land judiciously and sustainably in Qatar for PV development is driven by limited land availability to host MW-scale projects. Some project sites were proposed in the PNL talk. Project Navigator, Ltd.'s foundation is built on the application of science and engineering to solving environmental engineering challenges. PNL therefore maintains strong ties to academia as a source of ideas and talent. We also give back. 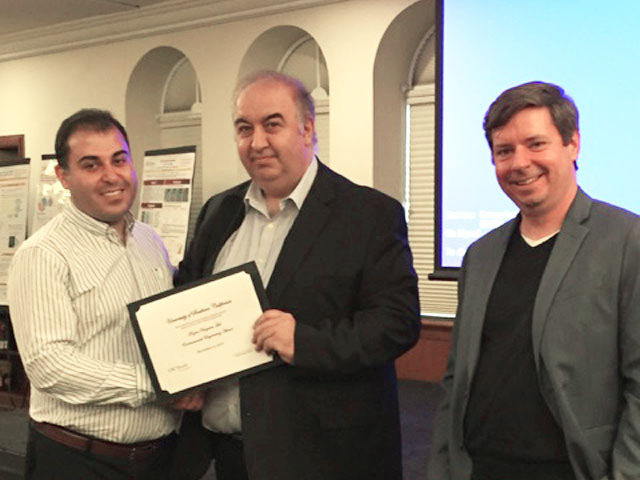 PNL's Dr. Halil Kavak participated as a judge in the University of Southern California's Department of Chemical Engineering and Materials Science annual student research symposium, and presented The Project Navigator, Ltd. Environmental Engineering Award for a best presentation in the area of environmental science and engineering. Ian Webster and Mark Landress of Project Navigator, Ltd. delivered two separate talks on oil field remediation topics at the 21st International Petroleum Environmental Conference held in Houston, Texas, October 14 to 16, 2014. Dr. Webster discussed the "soft science" of stakeholder management and approaches to improve trust between contentious parties during long and complex remediation projects, while Mr. Landress described methods and costs to remediate salt and produced water impacted surface soils at oil field sites. An article in Site Selection Magazine describes PV Navigator, LLC's niche business of developing PV solar power installations on closed landfill sites. Project Navigator, Ltd. (PNL), via its solar power projects development group, PVNavigator, LLC (PVN), has entered into a Power Purchase Agreement (PPA) with Southern California Edison (SCE) for a 3MW (AC) solar photovoltaic (PV) facility to be located at the closed Milliken Sanitary Landfill located in Ontario, CA. The power generated from the facility will be sold under the terms of the PPA for a period of 20 years. The Milliken Landfill Solar project will assist the utility in meeting their renewable energy portfolio goals. When online, the project will be the only renewable, commercial-scale solar development on a closed municipal landfill in Ontario. More on PVN's solar projects and capabilities can be found at www.pvnavigator.com and this news article from AltEnergyMag.com. 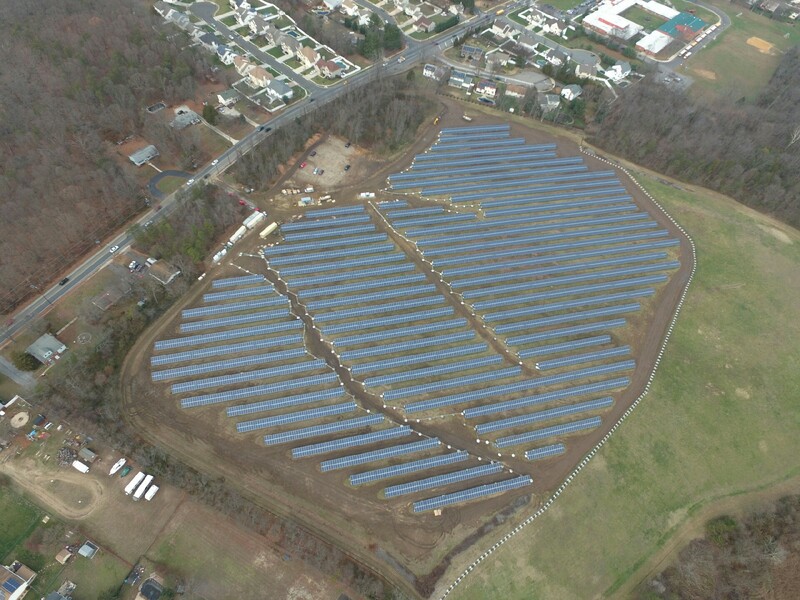 PV Navigator, LLC has received conditional approvals from New Jersey's Board of Public Utilities (NJBPU) to design, build and operate a 3.9MW (DC) racked PV solar power installation at the Owens Corning's closed Somerdale Landfill (300 Somerdale Road, Gloucester, NJ 08083) in Camden County. The Board's actions, together with an earlier NJ Department of Environmental Protections (NJDEP) approval of a landfill closure and PV solar, post closure use permit, paves the way for PVN to start design activities on the project. Via a donation, Project Navigator, Ltd. has helped fund the construction of planter boxes at The School of Tomorrow in Boyle Heights, California. PNL staff decided to help when we learned how the perception of soil lead impacts, associated with compliance issues regarding the Exide facility in Vernon, CA, were affecting school children's plans to grow vegetables. The work was funded by the California Energy Commission. The final report evaluated the performance of a solar racking system at the closed Operating Industries Incorporated (OII) Landfill in Monterrey Park, California a suburb in Los Angeles County located 15 miles southeast from Downtown. The system was placed at the landfill for over a year to assess its power performance and to assess its effect on the stability on the landfill cover. Geotechnical data collected during the project demonstrated that the solar racking system did not adversely affect the integrity of the landfill cover. The vegetation growth under the solar racking system was only slightly affected. No cap penetration was caused by the footings of the solar racking system. The results from this study indicated that a solar racking system on a closed large landfill is a feasible renewable alternative. A Project Navigator, Ltd. staff team continues to support the Community of Hinkley in their understanding of the technical issues surrounding PG&E's planning and remediation activities on the clean up of Hinkley's Chromium-6 groundwater plume. PNL staff recently provided a technical update at a July 17, 2013 meeting of the California Regional Water Quality Control Board, Lahontan Region in Barstow, CA. PNL's role in the project together with extensive background and interactive plume maps also appeared in local media and can be found at www.HinkleyGroundwater.com. The Ward Transformer Superfund Site Trustees have selected Project Navigator, Ltd. as their Project Coordinator responsible for overseeing, monitoring and coordinating all actions necessary to conduct the Phase II Removal Action as required by a 2005 Administrative Settlement Agreement and Order on Consent ("AOC"), and all actions necessary to conduct a supplemental RI and focused FS ("OU2"). Past operations at the Ward Transformer Superfund Site included the repair and reconditioning of transformers, which today has resulted in PCBs impacts in both soils and adjacent streams. EPA Region 4 listed the site on the NPL in 2003. PNL shall be responsible for all budgeting, establishing assessment schedules, and general project administration to complete the work in a timely, cost efficient and effective manner. Project Navigator, Ltd staff in Los Angeles are assisting the BKK Landfill Site Working Group (PRP Group) with all phases of current site management and eventual long-term remedy planning. The BKK Landfill is a State Superfund site of more than 500 acres, and is located in West Covina, CA. The majority of PNL's activities encompass site assessment, monitoring and maintenance, execution of an Engineering Evaluation/Cost Analysis (EECA), plus long-term Scope of Work, remedy selection and regulatory negotiations with DTSC. Fact Sheets and other project related documents are at http://dtsc.ca.gov/HazardousWaste/Projects/BKK.cfm. Project Navigator, Ltd. project managers continue to assist the Ascon Landfill Site PRP Group with work on key project phases and overall site interim management and monitoring. 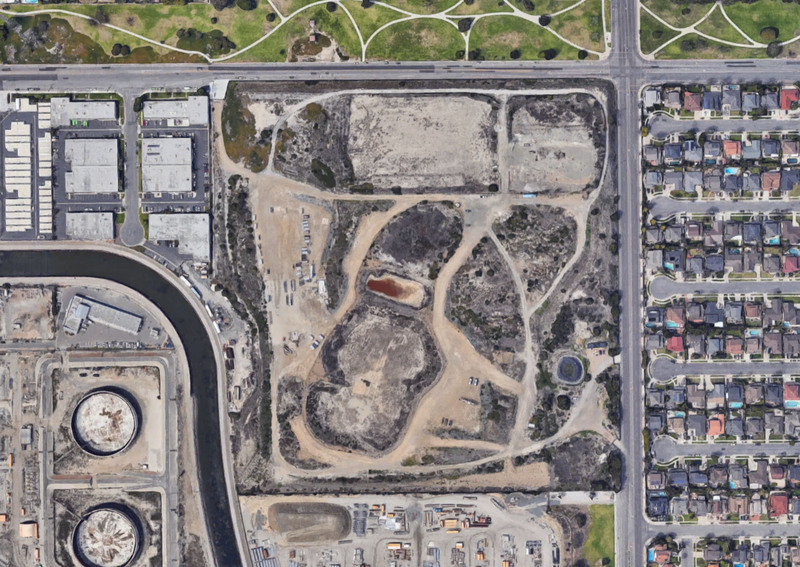 The Ascon Site, located in Huntington Beach, CA, operated as a 38 acre waste disposal site, accepting drilling muds and associated wastes for over a 45 year time frame. PNL is simultaneously managing two major documents in the CEQA process, the remedy EIR and the Remedial Action Plan, to completion. Project Navigator, Ltd. helps PRPs with Cemetery Relocation at a Texas Superfund Site. PNL's Houston office is assisting the PRPs, who are engaged in the early stages of the forecasted 4-year remediation of the Malone Superfund Site in Texas City, with the relocation of an old cemetery which is located within the boundary of the former waste disposal facility. Title to the cemetery land is also being held by a PNL subsidiary, Land Navigator, Ltd. More details are reported here. 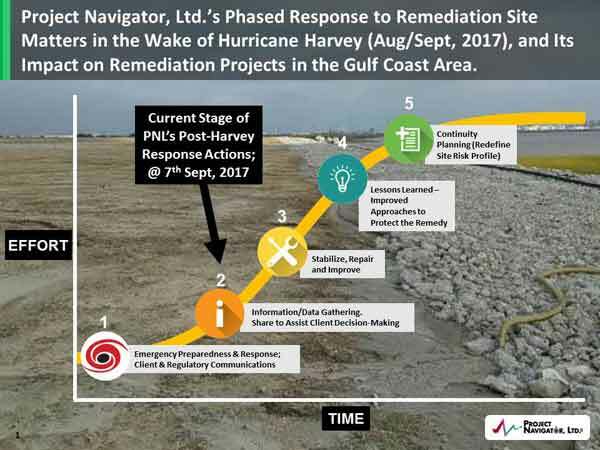 Project Navigator, Ltd.'s Houston, Texas office has been managing all aspects of the planning, design, and remedy construction at the Cox Road landfill site, northeast of Houston. Project Navigator, Ltd.'s Houston, Texas office has been managing all aspects of the planning, design, and remedy construction at the Cox Road landfill site, northeast of Houston. PNL has just received notification from TCEQ that all aspects of work proposed under the Remedial Action Plan (RAP) have been completed, as described in PNL's Response Action Completion Report (RACR) of February 2013. The site was cost-effectively capped with a clay and soil cover, and now enters a 3-year post-closure groundwater monitoring phase. PNL's clients are ExxonMobil, Lubrizol and US Steel. For more information on how PNL's Houston office can assist you on environmental remediation projects, please call us at 713-468-5004 or email Steve Maldonado at smaldonado@projectnavigator.com. PVNavigator contributed to the U.S. EPA's and NREL's recently-released (February 2013) document titled "Best Practices for Siting Solar Photovoltaics on Municipal Solid Waste Landfills." PVNavigator contributed to the U.S. EPA's and NREL's recently-released (February 2013) document titled " Best Practices for Siting Solar Photovoltaics on Municipal Solid Waste Landfills." The document was created to provide assistance in addressing common technical challenges and identifying the benefits for siting PV on MSW landfills. PVNavigator's graphics can be found on pages 9 and 37 of the PDF document. U.S. EPA has posted a draft version of their long awaited document titled "Best Practices for Siting Solar Photovoltaics on Municipal Solid Waste Landfills," to their website at http://www.epa.gov/renewableenergyland/. The document, coauthored with DOE's National Renewable Energy Laboratory (NREL), is extensive and detailed at 77 pages. PVN, a unit of PNL, is proud to have contributed ideas and advice during the formulation of the document, and is happy to see some our work product displayed. PVN's Dr. Ian A. Webster participated in the EDIN-USVI Energy Workshop held in Christiansted, St. Croix, USVI. The workshop focused on ongoing projects and strategies for the USVI to achieve 60% clean energy by 2025. These programs are part of the Energy Development in Island Nations (EDIN)-U.S. Virgin Islands (USVI) project launched in 2010 with the support of the U.S. Department of Energy, the U.S. Department of the Interior, and the National Renewable Energy Laboratory. PVN's specific business focus in the USVI is the development of PV solar installations on the municipal landfill sites on St. Thomas and St. Croix. PVN participated in the Oklahoma Brownfields Conference 2012 held in Oklahoma City, OK on May 22-23, 2012. Dr. Ian Webster of PNL discussed developing landfill based, PV solar power installations during an opening day plenary roundtable discussion. The panel was hosted by Robert Colangelo of Chicago's Green Sense Radio Show. Other panelists were Marielle Boortz of Chevron Corp., Marianne Horinko, a former Acting Administrator at U.S. EPA, and Mike Sheriff Head of Generation Planning at OG&E Services. Project Navigator, Ltd. was selected as the Independent Review Panel (IRP) Manager to assist the Hinkley Community and its Community Advisory Committee (CAC) with technical issues for the Hinkley Groundwater Remediation Project. Project Navigator, Ltd.'s solar power development business unit, PV Navigator, LLC has recently made significant strides in bringing a 1.5MW PV facility online. The development will be located on the cap of the closed Big Bear Landfill in San Bernardino County, CA. Read the news article from Big Bear Grizzly. Environmental Project Management Activities: 2010 to 2011 Summary. Many projects which had been in the planning stages in the mid to late 2000ï¿½s were significantly advanced, some even into and through remedial actions. In all the following projects PNL staff were deeply embedded and functioned in a remedy-influencing role, while at the same time, promoting a health and safety operating culture. Cox Road Landfill, by Houston, Texas: PNLï¿½s Houston office staff managed all aspects of the closure program for this former hazardous waste disposal site. The site was administratively placed into TCEQï¿½s Voluntary Closure Program. During 2010 PNL managed the PRP Groupï¿½s site assessment programs, which lead to the formulation of a containment and capping remedy. PNL managed all aspects of the EPC selection program, before moving into a construction management oversight role during the remedy constriction phase in 2011. Patrick Bayou Superfund Site, by Houston, Texas: PNL manages all PRP response efforts at this impacted sediments site which connects into the Houston Ship Channel. An RI/FS is underway. Malone Superfund Site, Texas City, Texas: PNL has managed all RI/FS activities at this 60 acre former waste disposal facility since 2007. With remedy selection occurring in 2011, the PNL team, on behalf of the PRP Group, has now selected an EPC resource, which we will now oversee and manage through the next few years of remedial actions. Remedy tasks will primarily include stabilization of 100Ks of cubic yards of oily sludges, for eventual onsite disposal in lined containment cells. Newark Bay, New Jersey: PNL performs as Project Manager for a group of ï¿½EPA generally noticedï¿½ parties, who are interacting with another entity who is performing the site wide RI/FS on the 8 square mile Bay. The RI is collecting information on the extent of sediments impacts. PNL reviews and comments on plans and work products. Southern California Groundwater Sites: PNL staff are assisting clients at 2 major groundwater assessment, remediation and litigation events. While confidential the work involves the compilation, interpretation and visualization of vast groundwater and soils lithology databases. At each site PNL is preparing a site conceptual model to explain the extent of impacts and the ongoing transport phenomena. In addition to the above projects PNL staff continue our project management duties on behalf of PRP Groups at other major project sites such as Ascon Landfill (Huntington Beach, CA), Purity Oil Sales Superfund Site (Fresno, CA), BKK Landfill (West Covina, CA), Waste Disposal Inc Superfund Site (Santa Fe Springs, CA) and the Operating Industries Landfill Superfund Site (Monterey Park, CA). Project Navigator Ltd. (PNL) has been retained by Coeur d'Alene Mines Corp. to assist in the development of a prospective solar development on the mine's behalf. PNL says it is seeking written proposals from renewable energy developers to negotiate and enter into a power purchase agreement (PPA) to provide all planning, permitting, financing, engineering, procurement, construction, operation, monitoring and maintenance of a solar power installation under a 25-year PPA at the Coeur Rochester Mine in Rochester, Nev. The mine operates with a system-wide electrical usage totaling approximately 35 GWh on an average operating year. Electronic copies of the request for proposals can be requested by emailing rpotter@projectnavigator.com with "Coeur Mine Solar RFP" in the subject line. The submission deadline is Oct. 17. Big Bear, Ca, February 14, 2011, 9:00am - A 2-megawatt solar power project has been proposed to top the Big Bear sanitary landfill site. Project Navigator, Ltd, a Brea, CA engineering firm has entered in to an option agreement with the County of San Bernardino to explore development of a photovoltaic facility on the closed landfill. If built, the site would provide enough power for approximately 2,000 homes, on land not usable for most other purposes. Local generation of this green power would reduce the valleyï¿½s need to import electricity and the costs associated with long transmission lines. Power from the project could move Bear Valley Electric towards its goal of providing 20% renewable power to local utility users. Building the solar facility would be expected to generate local jobs during construction and long-term jobs for maintaining the site. On Tuesday, February 15, a Power Purchase Agreement proposal will be submitted to Bear Valley Electric. When an agreement is reached, it would then be submitted to the California Public Utility Commission for review. Once a power agreement is in place, the project could then begin to seek private financing and begin the permitting process. PVNavigator, the solar power projects development group within Project Navigator, Ltd, is set to manage all phases of the project including design, permitting, financing, and implementation. 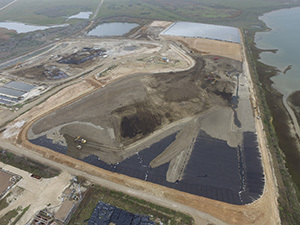 Since 1997 the company has specialized in managing landfill closures and developing solar projects on the closed sites. For more information, go to the companyï¿½s website at www.pvnavigator.com or email Robert Potter at rpotter@projectnavigator.com. BREA, CALIFORNIA ï¿½ Project Navigator, Ltd. (PNL), via its solar power projects development group, PVNavigator (PVN), has entered into a lease option agreement with the County of San Bernardino to evaluate and explore the development of a photovoltaic (PV) solar facility at the closed Big Bear Sanitary Landfill located in Big Bear, CA. The facility is planned to be sized at 2 MW (AC). Power is expected to be sold to the local Big Bear utility to assist the utility meet its renewable portfolio goals. When online, the project will be the only renewable, commercial-scale solar development in the San Bernardino Mountains. PNL has fourteen years of experience in the reuse of closed landfills. These capabilities have been integrated with PNLï¿½s more recently developed solar power expertise, under PVNavigator, to negotiate, engineer, finance and construct small-scale, landfill-located, distributed solar power projects nationwide. Ian Webster, Sc.D., president of PNL, commented, "This project moves us one step closer to our goals of developing renewable, solar energy solutions on brownfields and urban-located closed landfills that are otherwise deemed as unusable land." PVN will manage all phases of the Big Bear PV solar project including design, permitting, financing and implementation. The landfill solar project will deliver a local, green source of power to the mountain community, while preserving land resources. With the ï¿½site controlï¿½ option agreement in place, PNL will now enter into work on three fronts; namely, an interconnect application, CEQA compliance and power marketing. Project Navigator, Ltd. (PNL), and its solar power development operating entity, PVNavigator (PVN), is a Southern California-based developer of distributed, utility scale, solar photovoltaic projects. For more information, visit www.PVNavigator.com or www.ProjectNavigator.com. Download our Big Bear solar development brochure. PNL's PVNavigator Group has won a contract from the U.S. Army to assess the viability of using solar power to run remote electrical equipment at Fort Irwin, California. Fort Irwin is a major training area for the U.S. Military, and is located in the Mojave Desert in San Bernardino County. Facilities currently powered by generators, in training and containment areas, will be reviewed. The first phase of work includes the preparation of a work plan, site visits, modeling computations and recommendations. Project Navigator, Ltd. (PNL) staff recently discussed the business opportunities which can be realized from siting small scale solar facilities on brownfield sites or urban-located closed landfills. At Tech Connect World Summit Conference & Expo 2010, Anaheim, CA, June 21 to 24, 2010) we had a booth, system model and made a presentation. PNL staff, in collaboration with SunPods Inc of San Jose, CA, discussed our approach to the localized, urban delivery of power from systems sized up to about 5MW, occupying between 40 and 50 acres. Dr. Ian Webster represented Project Navigator, Ltd. at the National Brownfields Association's Atlanta 2010 Meeting on March 24 & 25. 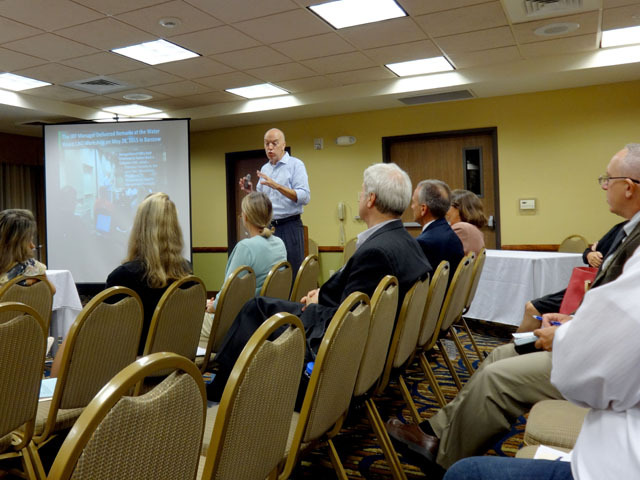 Ian was a member of a panel session covering Re-Powering America's Land: Renewable Energy on Contaminated Sites. Ian described PNL's business plan which entails the siting, design and financing of small scale, distributed solar facilities on Superfund or brownfield sites. PNL has assembled a portfolio of project opportunities. Many of these projects stem from the company's core business of Superfund site management. The business concept is described here, and the full slide deck can be downloaded here. Project Navigator, Ltd. has developed a rigorous protocol for the GIS-enabled screening of Brownfield sites. The system allows sites to be prioritized in the queue for reuse. Click here for poster. Drs. Halil Kavak, Raudel Sanchez and Ian Webster have worked for a number of major clients on landfill assessment and closure projects. A notable example is the Operating Industries Inc (OII) Landfill in Monterey Park, CA. In addition to helping with more routine site design and construction activities, the PNL team was asked to investigate and provide solutions to control and mitigate landfill waste prism fires (or enhanced oxidation zones). The PNL team used in well thermocouples to measure temperatures and produce 3D maps of the locations of the high temperature zones. The existence of high temperature zones (driven by air intrusion into the landfill prism) affects the ability to efficiently collect landfill gas and readily maintain perimeter compliance. The PNL team has now reported on some of the general findings. Click here to see how we have classified different types of landfill fires. Roberto Puga's PNL team is now actively engaged in planning activities related to the future demolition and cleanup at the former Asarco smelter site in El Paso. Communication and outreach will be an important component of a successful project. PNL is expert in the use of visual techniques and graphics to explain project activities ( Visual Navigator). In this regard, PNL graphics staff have just completed the assembly of site model to assist project activities. PNL's Ian Webster discussed how solar facilities can be sited on Brownfield Sites at NBA's Sacramento Meeting on January 14, 2010. The talk discussed how smaller, urban -located PV facilities, which are close to transmission and load, can be more quickly permitted, financed brought online, than larger competing facilities located in the desert southwest. Webster gave examples of projects which PNL is pursuing. Click to view the presentation or right-click to save it to your desktop.